The lakes of liquid methane on Saturn's moon, Titan, are perfect for paddling but not for surfing. New research led by The University of Texas at Austin has found that most waves on Titan's lakes reach only about 1 centimeter high, a finding that indicates a serene environment that could be good news for future probes sent to the surface of that moon. "There's a lot of interest in one day sending probes to the lakes, and when that's done, you want to have a safe landing, and you don't want a lot of wind," said lead author Cyril Grima, a research associate at the University of Texas Institute for Geophysics (UTIG). "Our study shows that because the waves aren't very high, the winds are likely low." The research was published in the journal Earth and Planetary Science Letters on June 29. Collaborators include researchers at Cornell University, NASA's Jet Propulsion Laboratory and The Johns Hopkins University Applied Physics Laboratory. UTIG is a research unit of the UT Jackson School of Geosciences. Titan is the largest moon of Saturn and one of the locations in the solar system that is thought to possess the ingredients for life. In photos taken by the Cassini orbiter, a NASA probe, it appears as a smooth brown orb because of its thick atmosphere clouded with gaseous nitrogen and hydrocarbons. However, radar images from the same probe show that it has a surface crust made of water ice and drenched in liquid hydrocarbons. On Titan, methane and ethane fall from the sky as rain, fill deep lakes that dot the surface, and are possibly spewed into the air by icy volcanoes called cryovolcanoes. "The atmosphere of Titan is very complex, and it does synthesize complex organic molecules—the bricks of life," Grima said. "It may act as a laboratory of sorts, where you can see how basic molecules can be transformed into more complex molecules that could eventually lead to life." 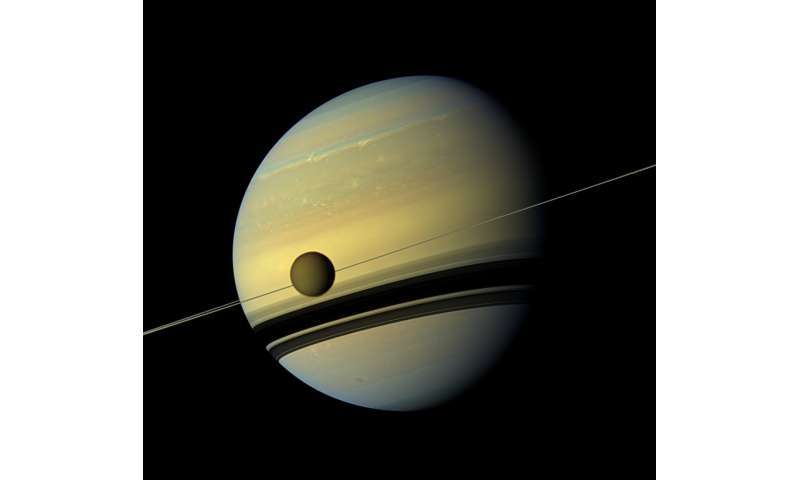 Titan is Saturn's largest moon. Its cloudy appearance comes from an atmosphere mixed with gaseous nitrogen and hydrocarbons. Credit: NASA Jet Propulsion Laboratory/ Cassini Orbiter. On top of that, it's also thought to have an ocean of liquid water beneath its icy crust. As a graduate student at the Université Grenoble Alpes in France, and then a postdoctoral fellow at UTIG, Grima developed a technique for measuring surface roughness in minute detail from radar data. Called radar statistical reconnaissance, the technique has been used to measure the snow density and its surface roughness in Antarctica and the Arctic, and to assist the landing site selection of NASA's Mars lander InSight, which is scheduled to launch next year. Researchers at NASA's Jet Propulsion Laboratory suggested he apply the technique to measuring Titan's waves. 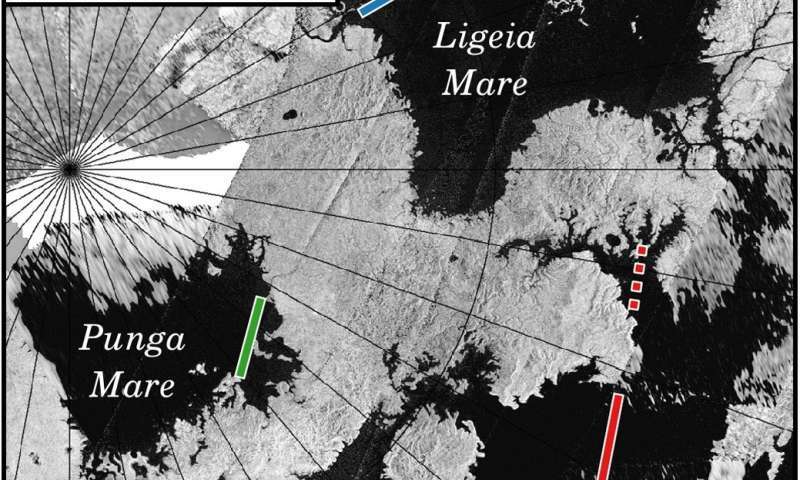 The research zeroes in on the three largest lakes in Titan's northern hemisphere: Kraken Mare, Ligeia Mare and Punga Mare. Kraken Mare, the largest of the three, is estimated to be larger than the Caspian Sea. By analyzing radar data collected by Cassini during Titan's early summer season, Grima and his team found that waves across these lakes are diminutive, reaching only about 1 centimeter high and 20 centimeters long. "Cyril's work is an independent measure of sea roughness and helps to constrain the size and nature of any wind waves," said co-author Alex Hayes, an assistant professor of astronomy at Cornell University. "From the results, it looks like we are right near the threshold for wave generation, where patches of the sea are smooth and patches are rough." The results call into question the early summer's classification as the beginning of the Titan's windy season, Grima said, because high winds probably would have made for larger waves. Information on Titan's climate is essential for sending a probe safely to the surface. Although there are no formal plans for a mission, Grima says that there are plenty of concepts being developed by researchers around the world. The study indicates that if a future mission lands in early summer, there's a good chance that it is in for a smooth landing. All forgotten (though recorded) we go with the same stories from the beginning. "After landing, Huygens photographed a dark plain covered in small rocks and pebbles"